The UofT AI v. AI Pong Tournament gives you the opportunity to get started with programming games using PyGame, compete against other UofT students, and win prizes and diplomas! Prizes: Gold, Silver, and Bronze medals for each member of the teams that win first, second, and third places. Diplomas for teams that earn Honourable Mention. (Get bragging rights for your resume!). You can run PongAIvAI.py in Python 2 if you download chaser_ai.py into the same folder, after you install PyGame for Python 2. See lines 392-393 in PongAIvAI.py for how to set the AI/human input functions for PongAIvAI. All UofT undergraduate students are eligible to participate. Previous contestants are only eligible if they submit a substantially new entry. The format will be determined after the number of entries is known. We will try to hold the final live. (Though that is not guaranteed.) Game parameters will not change by default (except for the score needed to win), but may change at the discretion of the organizer for tie break purposes. There is a 0.3 ms limit on how long it takes for your function to return a move. The tournament will be run on wolf.cdf or an equivalent machine. The parameters will stay the same as in PongAIvAI by default, but may be altered for tie-break purposes. Teams of one or two students are allowed to enter the tournament. Please submit a single python file whose name is [team_name].py. In the file, indicate the team name, the names of the members of the team, and the student numbers of the members of the team. 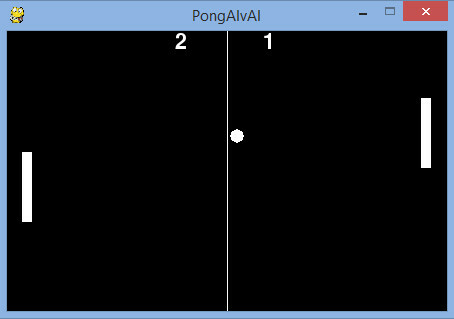 The file must contain the function pong_ai, which will be called the same way that chaser_ai.pong_ai() is called. Global variables are, of course, allowed. That way, you can figure out the velocity of the ball etc. Only import math and import numpy are allowed by default. Non-math/numpy/scipy imports without prior permission are not allowed. Meddling with PongAIvAI is not allowed. To qualify for the tournament, you must beat chaser_ai by at least 1000:850. Please submit the file to pong@cs.toronto.edu by 23PM on March 10, 2016.